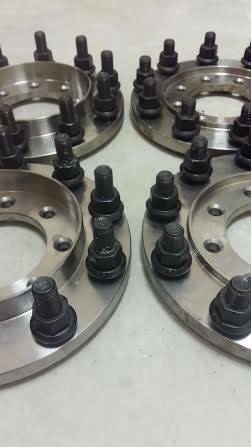 Diamond T Enterprises 8 lug to 10 lug hub-centric solid steel adapters milled to specifically fit 2005-2013 Ford F-350/F-450/F-550 dually trucks. Mount 10 lug on 285.75mm semi wheels on your dually truck. The industries toughest adapters, made from solid steel - ideal for the abuse and loads required by your 1 ton dually. Adapters are 7/8" thick. Rear studs are designed to allow use of 2 aluminum wheels, 2 steel wheels, or 1 aluminum and 1 steel wheel. Adapters are designed and manufactured in the USA! These are for the 8 studs on 200 which is the common size. Some F-450/F-550 trucks had 10 on 225, this would not be the correct set for 10 on 225. -Includes lugnuts for the 40 Ten lug pattern. High Quality We control the manufacturing process and have the highest quality standards! Superior Customer Service Find the answers to commonly asked questions. Copyright © 2019 Diamond T Enterprises. All Rights Reserved.